Sometimes you are smacked with something amazing. Something you wish you had thought of first or something you wish you could do. That is how I feel about this artist’s work. 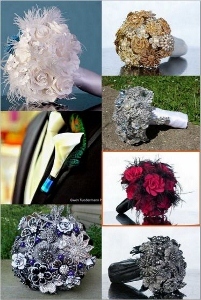 Eric from WeddingsAndWire is so creative and original it makes me envious! These cake toppers blow my mind. Each one is created to the clients specifications. Like off the wall? Super personalized? Then this is your guy. Giant birds, fast motorcycles, and bugs are his specialties.